You will see from the photos attached she is looking a lot different from when you last saw her, the engine housing has been lowered to make a more 'sensible' way to get to the aft deck, still got to install air intake vents to the top for those beasts to breathe ! I haven't yet done much to the engines as the wheelhouse and painting was more important, now that the weather is cold and damp its time to work on the engines. 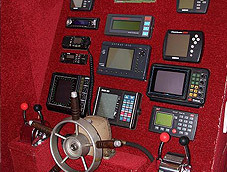 I think I have made her look bigger by fitting the new wheelhouse - certainly heaps more space inside - this leave I am installing a sea-toilet on the starboard side opposite the new console. Hydraulic steering has been fitted and new rudders to give better steerage to be fitted next month. The decks as you can see have been stripped right back, sanded & stained which although is alot more up-keep I think it does look better, I will be planking out the aft deck (instead of the plywood) obviously having removable sections for access, this will be stained aswell. An anchor winch which I got will be fitted to the forward deck with a new bow roller, abit of planning to go but am looking at a chain locker in the foc'sle but not too sure yet what to do. A bit of repair work to the stern has to be done, apart from that she is about ready to go back into the water which I am planning in Febuary. “I’m particularly saddened over how many of the UK’s historical military craft have now gone as boats like Thunderchild are stripped and then broken up. If I hadn’t bought her she would have been off for a date with `Mr Chainsaw`”, continues David with sadness. 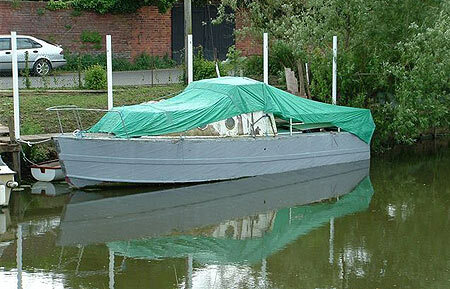 “When I bought her she was moored at Tewkesbury on the River Avon, which is where she is today. Her condition was pretty poor. She was leaking through various places, but nothing that I could not fix. For example there was a large hole in the starboard side of the engine room, which was covered by a substantial patch, and another smaller one on the port side close to the water line. It looked like a missile had gone in one side and out the other”. But, despite all this hard work David was to suffer a major blow when Thunderchild sank on her moorings a few years back. She spent almost 2 weeks, three quarters under water, lying at an angle of about 30 degrees, while David decided how he could rescue her. In the event, some plywood, nails and two sump pumps were sufficient to raise her from her murky resting place. An hour after making a start Thunderchild was afloat again but everything aboard had been wrecked, including the engine. “I still don’t know why she sank”, recalls David ruefully. “There were no leaks that I could see”. So, it was back to cleaning (the bilges and most of the topsides were full of river mud) and stripping out. Then just before Christmas 2006 she sank again when the stern mooring line snagged a tree during rapidly rising floodwater. Luckily, the water soon subsided sufficiently for the plywood, nails and sump pump rescue process to play their part successfully for a second time. In his spare time Graham Anderson is a volunteer crewmember with the Humber In-Shaw Rescue service. 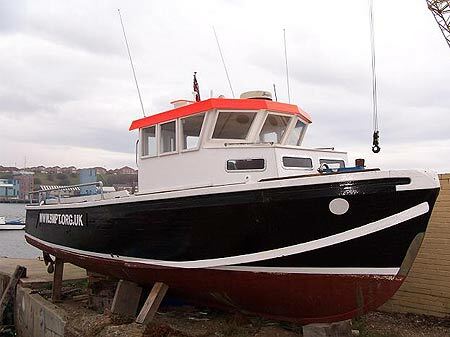 He is also the proud owner of Miss Sian, otherwise known in her working life as FMB 43129, a 35 foot Fast Motor Boat built by Osbournes of Littlehampton, West Sussex. Weighing some 3.5 tonnes she is built of Canadian Rock Elm with African Mahogany diagonal planking. Early versions of her class were fitted with twin petrol engines while later craft - including 43129 - had twin P6M Perkins diesels giving a her a maximum speed of 20 knots and 16-18 knots cruising capacity. Looking not too dissimilar above the waterline to the RAF's 41.5 Seaplane Tender with its single main cabin structure, originally 43129 would have had a centrally located cabin with two berths along both sides though, unlike the RAF version with it's enclosed helm position, the FMB had an open forward cockpit and centrally located wheel steering with only a screen for protection. Aft was a second small cabin housing a further twin berths. Access to the engines was achieved by lifting the hatches in the open rear cockpit. In all some 332 FMBs were built, of which British Power Boat Company built 36 while Osbournes assembled a further 30. 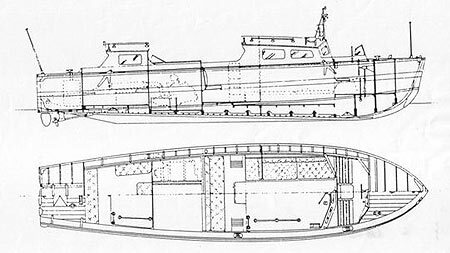 Among the original duties of boats of this type was to act as the Principal Power Boat on Southampton Class Cruisers as well as Barges for Flag Officers, Seaplane Tenders for Aircraft Carriers and as Picket Boats to supplement the 45ft versions on Capital ships. In fact, it was as the PPB for HMS Birmingham (a photograph taken of Birmingham shows an FMB alongside, almost certainly thought to be 43129) that she undertook much of her service with the Navy between 1945 and 1959. Graham, a member of the Hull Bridge Boat Club, bought Miss Sian from a fellow Club owner though says that initially he was somewhat sceptical of buying an elderly wooden boat. Being a plastic fanatic, at the time he owned a 16ft Microplus with a 15hp Yamaha outboard, ideal for his trips up river, which is very much his kind of pleasure cruising. 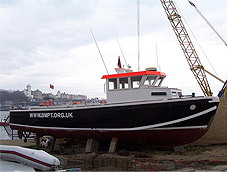 "We have all kinds of boats in the Club and we're lucky enough to have an old barge which we use as a dry dock so we can undertake the usual maintenance on the hull, which is ideal for wooden boats like mine." The fact that he can undertake this kind of work himself must have helped Graham in making the decision to buy the shapely ex-military craft though he admits to having painful memories of his first trial trip. While dealing with one of the warps as they let go to manoeuvre upriver Graham took off a finger end, which quickly curtailed the day's testing. Undeterred, however, and with finger end stitched back in place, he agreed to a second attempt, this time to fall for the charms of old wooden boats, and this one in particular. "We went for a 7 mile trip and that convinced me," recalls Graham. "It looked like a proper boat with cabins and twin screws while the incident with the finger has made me treat her with respect. Also, my wife likes her because she has wide decks either side of the cabins." Now looking radically different from when she was in military service in the '80s a previous owner made major changes to the topsides, fitting a centrally located fully-enclosed cockpit and providing twin berths in each of two cabins with separate heads and kitchen facilities forward. 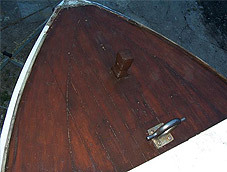 In addition, over the years a lot of remedial repairs have also been made to the hull. Even so during his inspection Graham could see that it needed still more restoration since there were leaks around the chine lines and some of the front frames and ribs were in poor shape and needed replacing. 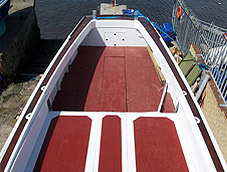 In addition to changing out the rotten timber, since buying her in April 2004, Graham has raised the head height in the cabins (at 6' 3" tall he says he was fed up with banging his head) as well as re-skinning the hull entirely in 9mm marine ply and giving her a new coat of paint overall. As for future work he says he's got some work to do on a smoky P6 Perkins engine. "Could be the injectors or even the rings," he adds, though clearly, despite his early trepidation over timber craft he's very much been bitten by the bug. "I have fishing in my family background," adds Graham, "which is perhaps why I like the water. As a member of the Humber Rescue squad we have over a hundred shouts a year so if I'm not working on the boat I'm probably out in the Humber Estuary. Our two main calls for help are over people who've jumped off the Bridge or craft with engine failures." Meanwhile, preferring river trips to the open sea during the summer he and his wife enjoy spending most weekends on board Miss Sian, as well as the challenge of maintaining such an unusual craft. Wishing to find out more about the history of his fascinating craft Graham contacted the British Military Power Boat Trust and through the good offices of the knowledgeable Phil Simons - the Trust's Honorary Historian - he was able to gain a clearer insight into her background as well as obtain copies of construction drawings, which should prove invaluable for future maintenance work. "The fact that she was associated with HMS Birmingham makes it a bit special for me," he says with pride, adding that he'd like one day to restore a completely standard FMB. "That would certainly be an interesting project."